The library presently operates on Saturday from 9:00 a.m. to 2:00 p.m., and Monday through Friday from 9:00 a.m. to 6:00 p.m. and will do so until December 18, 2015. It will then close for Christmas vacation. The programs which take place in the library have been designed by board member Mtra. 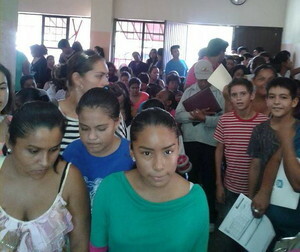 Dulce Anyra Cota Salazar. 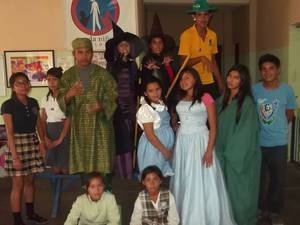 Biblioteca Abrapalabra has classes for young boys and girls which include a reading circle and arts and crafts. These take place on weekdays in the afternoons and on Saturday mornings. The picture below shows the children making witches out of paper. 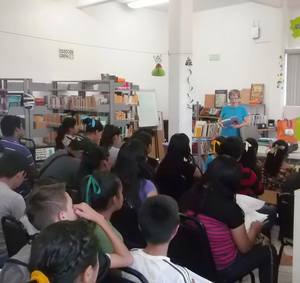 English classes take place on Saturdays from 9:30 to 11:00 a.m. Maestro Alejandro Merino Orea continues with his theater group. At present they are rehearsing "The Wizard of Oz." Through the end of school year 2014-2015, thanks to the help of our many donors, 306 students have graduated from junior high school and 75 completed senior high school. Although our scholarship program is for adolescents to continue their studies in high school, some donors have graciously requested to help their student complete his/her higher education. Seven of our students have completed college or university. For school year 2015-2016, we are helping 181 students; 112 of those receive a complete scholarship which includes money for transportation and tuition expenses. Thank you to our many sponsors for supporting these hard-working adolescents continue their education. 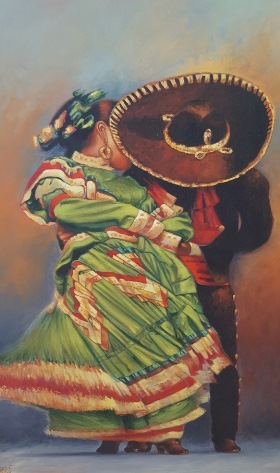 Come join us at the Golf Club at Costa Baja for our annual “Velada Muy Especial” (Very Special Candlelight Dinner). This event will raise money for our scholarship program. The date is November 27, the day after Thanksgiving, at 8:00 p.m.
Tickets will soon be available, 500 pesos if purchased before November 21, when the cost will raise to 550 pesos. There will be room for 250, so please tell your friends. A delicious dinner will be served by Steinbeck’s Restaurant, two bottles of wine on each table. The menu is still to be decided on. If you would like tickets, please contact Veronica at fanlap@hotmail.com or Judy at jupete49@hotmail.com. Follow us on www.facebook.com/fanlap for further details. Below is a picture of the volunteers from the velada 2014. Photo taken by Ruth Ramirez. SUBASTA 2013 was the last year this event took place at Marina de La Paz when we celebrated the 25-year anniversary. In December of 1988, Club Cruceros had the first such auction at the marina. On December 7, 2014, we held the event at el Mangle, located at the end of Calle Sinaloa and the beach. This turned out to be the perfect location. We hope to have a better result this year. 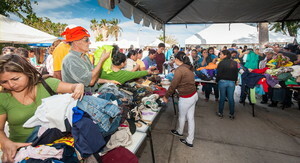 We will once again have the table with gently used clothing, another table with electronics. Because of the problem of logistics, and lacking a large storage area, we'll no longer have a live auction. However our silent auction will have wonderful items on which you may bid. Last year our earnings paid some of the expenses for our dining room from January - April, 2015, and helped pay some expenses to run the library. Below is a picture taken of Subasta 2014 by Photographer Tom Ireton. We plan to hold the drawing on December 24, 2015. 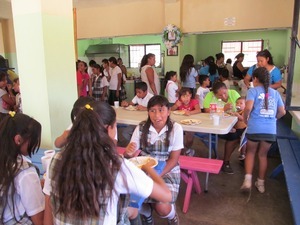 After meeting the children of the colonias in 1996, when we were introduced to a breakfast program in Colonia Marquez de Leon, we formed a non-profit to help children and adolescents of these neighborhoods receive an education and proper nutrition. 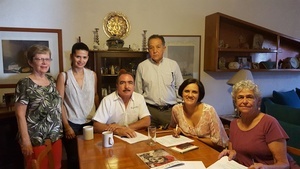 Our present board is composed of .... from left to right in the picture below ... Judith A. Peterson, legal representative; Andrea Gaume Amao, president, Eduardo Pino Von Borstol, Treasurer, Dr. Alejandro Aguirre Chaves, Secretary, Dulce Anyra Cota Salazar, board member in charge of education and psychology programs, and Mary Shroyer, vice-president. Not present is Luis Fleischer, board member in charge of public relations. If you make a donation through International Community Foundation before the end of December 2015, your donation will be matched. Simply click here to double your impact. You may also write out a check in the name of International Community Foundation and send it to them at 2505 N Avenue, National City, California 91950. Remember to put "children of La Paz" in the bottom left hand corner of your check. For more information about all our programs and accomplishments, or how you may help, please visit our website at www.lapazninos.org. For the last 15 years we have helped hundreds of children with proper nutrition, providing materials and paying transportation and tuition costs for them to attend junior and senior high school, and now have a library to provide a quiet place where students can study and young children can learn the world of books and computers. This is thanks to our supporters, like you. Because we have to rely on our supporters for over 80% of our funding to make our work possible, donations in Wills are hugely important to FANLAP. Many more children could be benefiting from FANLAP’s scholarship program if we had the funds. You can help us to maintain the present number of children we are sponsoring, and to reach others in the future by leaving a gift to our organization in your Will. Thank you for helping ensure a better future for these children and their families. 1) For a 501 (c) 3 tax deductible receipt, write a check to International Community Foundation and mail it to them at 2505 N Avenue, National City, Ca. 91950. Be sure to write ¨children of La Paz¨ in the left-hand corner. 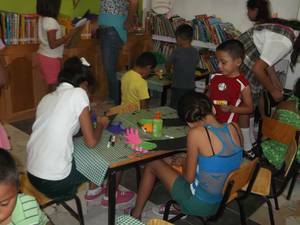 3) Write a check (U.S. dollars or pesos) to Fundacion Ayuda Niños La Paz and send it to us at Calle Santiago 320, Col. Bella Vista, 23050, La Paz, BCS, Mexico. 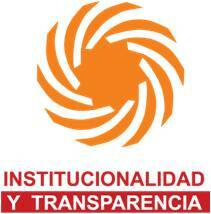 4) Direct deposit to Bancomer account number 0169931104. 5) Go to our web page at www.fanlap.org and click the PayPal button. Be sure to send us your name and address so we may send your receipt.